Banking just got easier! Now with our New Online Banking App you are able to check you balances, make transfers, and pay your bills on the go. On your mobile device, access your app store and search for “Falcon Bank Mobile Money” under the finance section. Users are also able to use their Touch ID sensor for their log in on IOS devices. Text 'BAL' to get the current balances of your selected accounts. 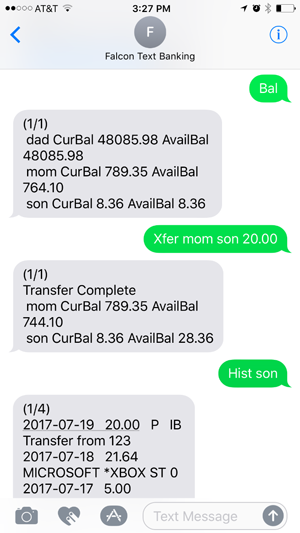 Text 'HIST (nickname)' to receive history on account selected. Text 'ATM (zip code)' for nearest ATM locations.